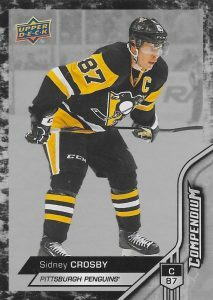 2016-17 Upper Deck Compendium Hockey is another ePack-exclusive from UD as they continue to expand their online format. The new brand is issued in three series across the '16-17 season. Starting with a robust 900-card base set that is split into three different 300-card releases, collectors can find retired legends, current stars and top rookies. This includes the very first Upper Deck card options for several players. Blue, Red, Gold and Magenta are among the parallel options. The first three physical parallels are made by collecting base versions while the digital Magenta parallel is pulled in packs at 1:3 odds. There are also physical Printing Plates that are randomly found in packs. Digital inserts in 2016-17 Upper Deck Compendium Hockey include Carbon F/X and Net Destroyers, each falling 1:12 packs. Series 2 includes Alloy Superstars and Net Minders, also 1:12 packs. Finally, Series 3 closes out the digital inserts with Laser Focus and Net Grinders. While most of these pack-pulled cards are limited to the digital realm, the physical aspect comes from the achievement cards earned by making sets or combining a specific number of cards for one player. That means the entire 900-card base set can be acquired in physical form with the parallels. SP Achievement cards are earned from making full base sets and Heart & Soul Achievement cards come from building the insert sets. 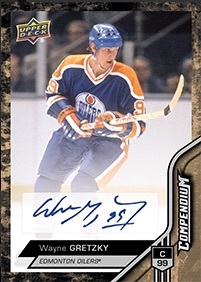 Although it is no small task, a Wayne Gretzky Gold Autograph card or one of four random Autograph Magenta Rookie cards are in play if you meet the SP Achievement requirements. 2016-17 Upper Deck Compendium Hockey packs sell for $0.99 on the ePack site and include eight digital cards. The 24-pack boxes go for $22.99. Release Date: S1 - 12/7/2016; S2 - 4/13/2017; S3 - 5/31/2017. Info regarding the physical versions can be found on the Product Details tab. 900 cards. Shop physical base parallels on eBay. PHYSICAL PARALLEL CARDS: Blue, Red, Gold, Printing Plates. PARALLEL CARDS: Blue, Gold, Magenta, Red. *Gretzky also has a signed Achievement parallel. 25 cards. 1:12 S2 ePacks. Digital cards. 25 cards. 1:12 S1 ePacks. Digital cards. 25 cards. 1:12 S3 ePacks. Digital cards. 10 base x 5 blue x 5 red = 250 copies of the same player. 225,000 / 7 = 32,142 packs in order to get a Gold Signed Gretzky??!! Am I missing or misinterpreting something wrong here?? I hope my numbers are wrong or the explanations they offer are misleading, because if one needs to spend 32,000 US dollars on ePacks to get a Gretzky, THIS ASSUMING that the players are distributed absolutely equally, there’s something wrong with this. Any thoughts guys? Hmm, your calculations are correct which once again shows that these e-pack is just another way of making money and destroying the hobby. Please take this away. Well, if you count it like that, make sure you apply the logic to different stuff too, to keep it on perspective. 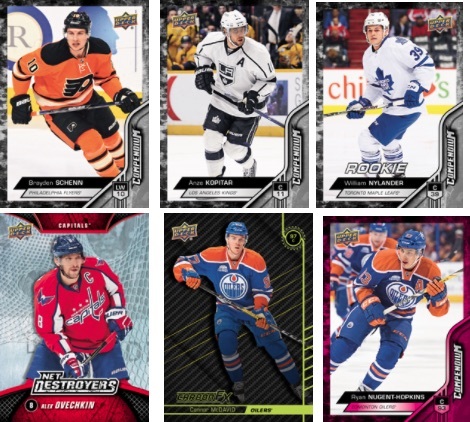 If we really take out the trading option, then to pull, say, Connor McDavid High Gloss was like: One Exclusive in ten boxes, one High Gloss in 100 boxes, 250 cards in the set so 25k boxes and each box costs $100 so $2.5M on average. The exact number is not important, the magnitude is. What I’m saying is that $32500 is not that much on todays hobby to “guarantee” a certain card. 1) Putting together 250 copies of a wanted card (Crosby, Nylander, Price…) is a very tough task. Someone has to have five Reds on hand at the same time or no-one has the Gold. Somebody redeems Red Crosby or somebody combines Red parallel set -> You just lost 50 Crosbys from circulation. 2) Someone hoards a couple of Gold parallels of a given player to himself and redeems them -> You just lost 500 copies of that card from circulation. 3) You can’t get lucky. 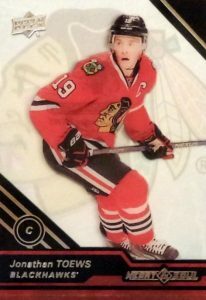 You can’t buy one pack and hit an instant winner as you can with that McDavid High Gloss. 2016-17 Upper Deck Series 1 Hockey Hobby Box Auston Matthews Young Guns? 2016-17 Upper Deck SP Authentic Hockey Hobby Box Sealed Matthews Marner Laine?